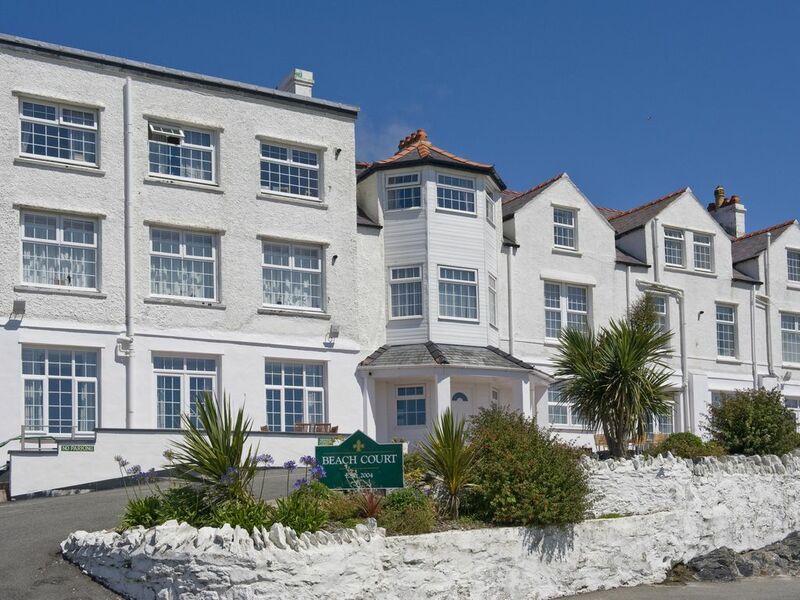 The Penthouse is located on the top floor of the former Beach Hotel and is situated in the heart of Trearddur Bay with a wide range of restaurants, pubs, shops and amenities close by, and the exceptional European Blue Flag beach less than a five minute walk away. Comfortably accommodating up to six guests in the large open plan living space, with three bedrooms and three bathrooms, The Penthouse is ideal for families, friends or couples to enjoy their holiday with plenty in the surrounding area to see and do. This bright and spacious apartment has been designed with a contemporary feel in mind and an uncompromised attention to detail. Our primary focus when preparing The Penthouse was to ensure our guests will be as comfortable as possible. Carefully selected furnishings and tasteful décor combine to provide a truly delightful and relaxing environment. In the main lounge area there is ample space for guests to relax on the comfortable three piece suite. A large flat screen TV with integral Freeview, a Blu-ray player and Video recorder are also provided along with a selection of DVDs and videos. Adjacent to this is the play room which comprises of a large flat screen TV with a Sony PlayStation 3 and a selection of games, and table football. There is also a selection of conventional board games and books available. Free Wi-Fi is available to all Penthouse guests. A large extending glass dining table and six chairs provides space for guests to dine in comfort. The superbly equipped kitchen is again of a modern design and comprises of a gas hob, electric fan oven, integrated fridge/freezer, microwave, kettle, toaster, sandwich maker, Senseo coffee machine, dishwasher and washing machine. There are three bedrooms; one king, one double; both with ensuite bathrooms, one twin bedroom and a family bathroom. All baths have a thermostatic shower over and shower screen. Please note: A returnable £100 damage and security bond is added to your booking. Our experience shows that this procedure results in an all round better holiday for everyone, as we as home owners are prepared to offer a better quality property for our guests and all guests fully respect the property, so making manageable the process of preparing the property for the next guest's full enjoyment. Nearly all our guests are respectful people where the bond is fully returned. We have a high proportion of returning guests who are appreciative of our service and the high standard of accommodation that we strive to provide. Thank you in advance for your co-operation. Hello, my name is Cheryl, I live in Bolton with my hubby Pete and our three mischievous but gorgeous kids; a son and twin daughters. A great base for exploring Trearddur and other parts of Anglesey. Cosy penthouse flat with large living area and three lovely bedrooms. Easy walking distance to some lovely places to eat if you want a break from cooking. We will be back! Clean, tidy and had everything that was needed. We have previously used HomeAway when we rented an apartment in Cyprus some 18 months ago. Once we found the location of the safe key pad and put the heating on, everything was fine. Just ensure that when spare batteries and light bulbs are said to be available that they are. Everything else was fine. We have a long connection with Treaddur Bay having had a caravan on the Lee Caravan Site for over 20 years only relinquishing it in 2000 when all the children had grown up. These two nights and three days enabled us to visit old haunts which brought back happy memories. I would recommend the Penthouse if the family want to come down to Treaddur in the future. We're absolutely delighted you enjoyed your stay and had fun revisiting the beautiful island. Thanks for letting us know about the shortage of bulbs/batteries, unfortunately on this occasion it was just an oversight but we will ensure that there is sufficient supply for every guest. Perfect apartment, clear instructions and guidance for access. Apartment fully equipped with everything and more needed for a comfortable stay..... .perfect location for exploring the stunning island of Anglesey. Cheryl the owner was super helpful and very welcoming. My husband and I, along with 3 teenagers and our dog stayed from the 4th August for a week. The apartment is in a great location near to the beach, shops and restaurants. The property is very clean and had all the mod cons. The beach is not crowded and we all wished we could of stayed longer. Lovely apartment with everything you need. Good location near to the main beach and coves. Helpful owner. Delighted you all enjoyed your stay. Thank you for your kind review.